This new range of brake rotors are designed specifically for ATV, Quad and Side x Side machines. The lightweight vee profiled contour rotors look great and are self cleaning whilst improving brake performance at the same time. They are manufactured in the EBC Brakes UK manufacturing plant from durable, heat treated German mill rolled stainless steel with a diamond ground finish. Designed to complement the X, R and SV range of brake pads. Suitable for either street or off road use, these hybrid carbon impregnated pads give medium lifetime and powerful cool disc temperature braking thanks to the carbon granules used in the friction material. Popular with riders of ATV and moto-x sport bikes in dry, cleaner riding conditions or enduro streetbike use. 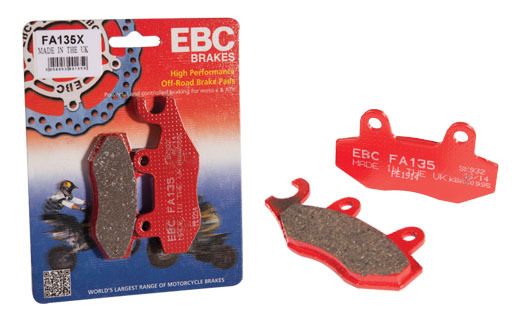 Use EBC Brakes popular MXS sintered brake pads if you require longer life or for use in extreme mud riding or for ATV, use the R series heavy duty sintered pads. 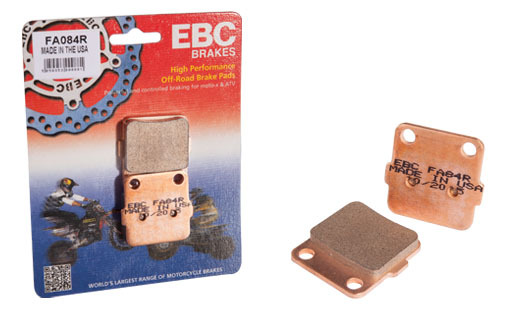 EBC Brakes R series sintered brake pads feature high density sintered copper formula exclusively made for the ATV off road market to give a longer lifetime. 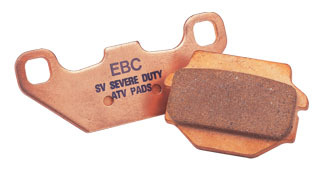 These sintered SV series ATV brake pads are made in the USA sintering plant with long lasting sintered copper alloy. The perfect pad if you want durability, they are also less abrasive and will not damage brake rotors.